When I think of doing school as a child, I think of sunny days spent hanging upside-down on the monkey bars while my mom sat on the grass reading to us. I think of cuddling next to her on the couch, watching the rain on the windows as she read. Always reading. I think of doing math at the grocery store as we shopped. I think of endless days spent in deep play with my brother, building forts, building robots, building mud villages in our backyard, building a rocket, building our imaginations. Neither of my parents had even graduated from college themselves, but they managed to give us what I now consider the most important facet of education: freedom. Freedom from clocks and rules and manipulation and control. Freedom to be ourselves. To learn, and discover, and BE, at our own pace and according to our own interests. And from this freedom the ability to teach oneself, to learn naturally from the world all around us, as every human is wired to do. The drive to learn, to discover, to pursue goals, to sort through information without outside control or pressure. My mother instilled in us the belief that this drive is present in every human being, and that learning is a lifelong pursuit. Still…when my first child was born, I found myself conflicted. I had this romantic idea about “school” as this place where all knowledge lay at one’s fingertips. An idea born from those endless clips on Sesame Street of happy children dancing off to school to have adventures. A vague feeling that I had somehow missed those adventures. An anxious worry that perhaps I, who had spent most of my teenage years traipsing around the globe versus doing algebra, had somehow missed the important knowledge imbued in my public school counterparts. There was a part of me that wanted all of that for my children. Wanted it for myself maybe. To have that moment where I stood at the end of the driveway waving a cheerful goodbye to my backpack-laden child with her put-together outfit and neatly combed ponytails. I wanted to pack sweet little school lunches, and go shopping for all those neat packages of pencils and markers. Did I really want to raise my children “outside” of society, like I had been? I wasn’t sure. So when my daughter was preschool age, we joined a mainstream co-op preschool. It’s just to socialize, I said. It’s a co-op, I can go with her to class if I want, it’s not “real” school. I needed to stick a toe in the door of normal and see if it felt right. See if those adventures were all they cracked up to be. And in many ways, they were. She was only two at the time, and the program was entirely play-based. We spent a year with a wonderful group of people, many of whom are still close friends. Normal wasn’t so bad! True, there were things that annoyed me. Tiny red flags that I tucked in my back pocket. Like the daily coercion of the children to do the day’s art project, even though they were busy building a block tower. My “unschooled” mind said: wait! They’re busy! They’re cooperating with each other, testing balance, learning engineering! You’re going to interrupt their play to insist they glue some cotton balls on a piece of paper? Just so you can stick said cotton-ball creation in their cubby to prove they “did” something to the smiling parents who pick them up? Still, we enrolled the next year. It was still just preschool. We hadn’t joined the Dark Side. Not yet. And then, I began to see changes in my daughter. Tiny, subtle changes that I might not have noticed had my brain not been unschooled. 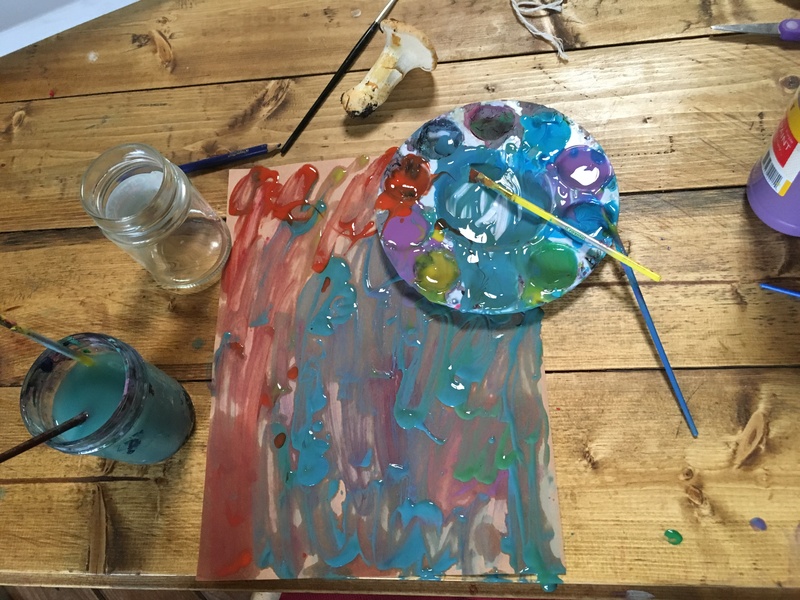 I noticed her mindlessly scribbling some color on paper at school, because that’s what the other children were doing, or because she didn’t feel like painting at that moment, when at home she would draw people with bodies and faces and expressions. I noticed her play and her attention becoming fragmented. And one day I had an epiphany. I was trying to get her out the door for school, anxiously watching the clock because we were running late. I walked into the living room with a put-together outfit in my hand and a coax on my tongue…and stopped. There she was, building a train track, warm and cozy in her footy jammies, deep in her play. One train was discussing with another train how to help a third train who was sad. She was learning. Really learning, not coerced, manipulated adult-agenda learning. Learning how to entertain herself. Acting out conflict resolution. And I was going to interrupt this…to what? Force her into clothes, drag her out in the rain, and take her to squish play dough somewhere else? So we didn’t go. And then we didn’t go the next day. Finally, I pulled her out. It was just preschool, I said. No rush. Still, I wasn’t quite ready to pull my toe out of the door of normal. I still had romantic ideas of sending her to that sweet little building down the street where we went to ride our bikes, with it’s organized eraser-smelling classrooms. Surely wonderful adventures in learning happen there! But of course, being an unschooler, I had to find out myself. So I volunteered in the kindergarten class. And in one day all of my romantic ideas of school melted into a puddle like sidewalk chalk in the rain. I did not see learning. I saw control. I saw manipulation. I saw children too young to sit still for five minutes being expected to keep their bottoms in a chair and focus, while their little bodies squrimed to be let loose. Until they finally were, for an appallingly short recess whereupon they ran like frenzied puppies around a too-small patch of concrete, before being lined back up and marched back to their desks, fed a sugar-filled snack, and expected to focus again on their “work”. And what boring, relentlessly repetetive work it was! It happened to be Earth Day that day. I watched this group of children sitting, with bored, blank stares, watching a bored teacher reading a boring book about the ocean (“in honor of Earth Day!”)…while outside the sun was shining! And then came the real clincher: the sticker chart. As a final ending note to the day, the children were made to sit on the rug while the teacher placed a sticker (or didn’t) on a chart under the name of each child who had had “good behavior” that day. My goodness! Sesame Street never said anything about public shaming. My unschooled brain recoiled. And even worse was the bar by which the teacher was measuring “good behavior”: did you A) sit still, B) stay in your chair, and C) raise your hand instead of shouting out an answer. Really?? Not: were you kind, did you help a friend, did you learn something new? Wow, said my inner Unschooler. Not what I expected. So I went home. And I sat on my couch with my sweet little girl and read, like my mother before me. I read as she hung upside-down next to me, in her underwear. And I didn’t tell her to sit still. We planted some seeds, for Earth Day. And the toe I’d been keeping in the door of normal slipped out for good. If that was normal, then we were very happy to stay outside, thankyou. Now, that little girl is six. She reads Tolkien to her two little brothers, and does math two grades beyond her level…when she feels like it. Which is sometimes while eating pancakes, and sometimes outside under the grapes, and sometimes at night by candlelight. And I feel content, knowing that I’m giving her and her brothers the greatest gift I can: freedom. What our earth needs is World-Changers. Free-Thinkers. More people who question the status quo, who are willing to live outside the box. Because the box is getting smaller. Our planet is on the edge of an ecological tipping point. And meanwhile our society is tossing up the likes of Donald Trump as the best option we have? There’s no time left to push things off on the next generation. WE ARE the generation who must change. The very last thing we need is more automatons. More adults who just plug in the fridge, even though is cold outside; who drive the car, when they could ride a bike; who continue to purchase food from across the globe instead of their own neighborhood; who empty our precious groundwater onto green lawns instead of planting their dinner. Change is hard. It doesn’t happen in a day. But it can easily happen in a generation. However we choose to educate our children, it is the responsibility of us parents to raise children who will live differently. Children who do not just memorize facts to pass a test, but who have a deep relationship to the natural world around them, and a mind that is free enough to re-invent the way we humans live on this precious planet.